Amateur astronomers from Karachi and Lahore gathered together at an observing session at Badro Jabal (in rural Sindh) in early December, 2010. Amateur astronomy is getting serious in Pakistan. This may appear unlikely, but it is certainly happening. Astronomy is taking off in Pakistan. Last year, I had several posts on the truly outstanding series of events that Khwarizmi Science Society (KSS) organized to celebrate the International Year of Astronomy (IYA). They not only held public astronomy nights in Lahore, but also brought telescopes to schools in some of the rural areas of Punjab. And the turnout and the reaction was fantastic (for earlier posts on this, please see here, here, here, and here). This is not the efforts of an isolated group. Earlier this month, Karachi Astronomy Society (KAS) organized an observing session at Badro Jabal - a dark site, located several hours from Karachi. 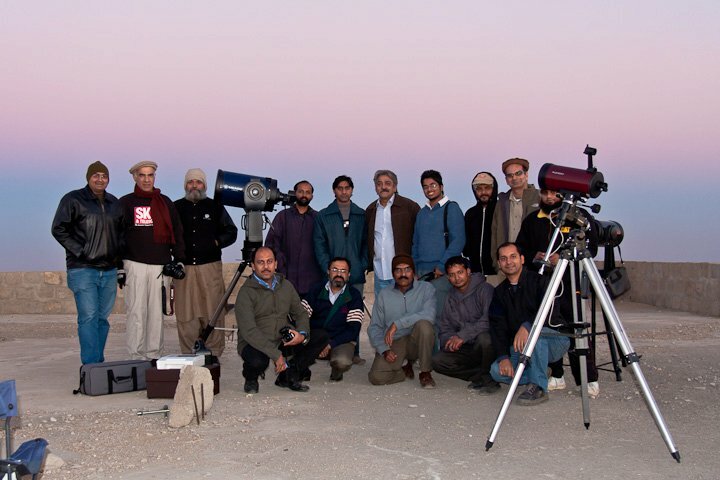 Nineteen astronomers from Karachi and Lahore participated in this event, and they brought with them five telescopes, including an 18-inch (diameter) Dobsonian. 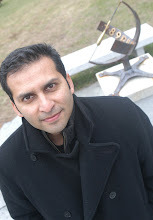 In addition, Umair Asim in Lahore has been taking some outstanding images from his observatory, hosting a computerized 14-inch Celestron, on the roof of his house. Back in the late 80s, a few of us also organized some astronomy events and observing sessions in Karachi. But the numbers were small and the efforts inconsistent. It looks like astronomy in Pakistan now has attained a critical mass and it seems that it will be growing in the coming years! Fantastic. 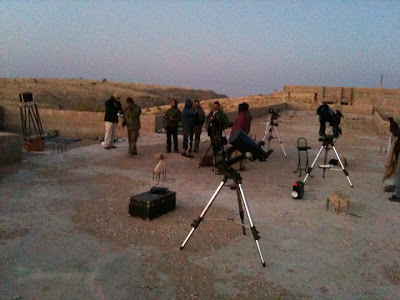 Nocturnal astronomers can't wait to see the Sun go down at Badro Jamal. Damn you light! 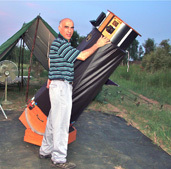 Khalid Marwat with his 18-inch Dobsonian telescope. 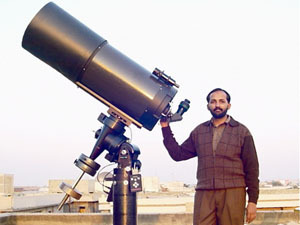 Umair Asim with his 14-inch Celestron telescope. Please take a look at his wesbite and blog. In particular check out his efforts to image a planetary nebula in the globular cluster, M15. 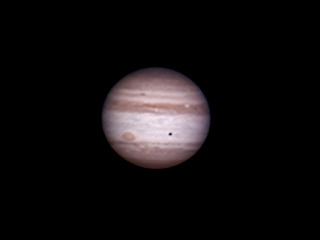 And here is a fantastic image of Jupiter by Umair. You can see the Great Red Spot as well as the shadow of Jupiter's moon, Europa. And this image has gone through the lights of Lahore! The name of this place is Badro Jabal. I don't know what is the background of this name, but literally it means "mountain of the full moon". I had visited this massif at 3000 ft in the first week on Nov this year with three other members of Karachi Astronomers Society, on my recent visit to Pakistan. The sky was so transparent, we could see the Earth glow even on the half moon (which itself was blinding). So I can presume a full moon would be quite a spectacle, hence the name. I literally "discovered" this place using Google Earth while looking for possible venues for altitude astronomy (and an observatory in future) at an easily accessible and roadable location not too far away from Karachi and still far away from city lights. Badro Jabal was the best in all respects. The visit in Nov was a probe mission to check the feasibility of carrying out astronomy sessions there which paved the way for this bigger event in December. Thank you Salman for posting this update. A lot more is going on at the astronomy scene in Pakistan, including designing and making of bigger and better astronomical telescopes. We literally have taken off...thanks to the ambitious astronomers in Karachi, Lahore, Quetta, and in fact all over Pakistan.